As you try to get out of bed in the morning, your knees feel stiff, making it difficult to start your day. When you engage in physical activity, your knees begin throbbing with pain. You may even experience some swelling. You shouldn’t rule out the possibility. When it comes to Americans over 45, up to 13.5% of men and 18.7% of women are currently dealing with knee osteoarthritis. But approximately 2 million more Americans below the age of 45 suffer from the condition as well. Are you looking to get to the bottom of what’s causing your chronic knee pain? Read on to find out the signs and risk factors for knee osteoarthritis, what causes the condition, and what steps you can take to treat it. The term “arthritis” actually covers between 100 and 200 health conditions. It simply refers to the inflammation of at least one joint in the body. There are several sources of arthritis pain in the knee. These include post-traumatic knee arthritis, rheumatoid arthritis, psoriatic arthritis, and gout, among others. However, osteoarthritis is the most common type. While most types of arthritis have similar symptoms, they have distinct causes. For example, rheumatoid arthritis is a disease where the body’s immune system attacks its own healthy cartilage. Osteoarthritis, on the other hand, is a degenerative form of arthritis that occurs due to wearing down of cartilage. Osteoarthritis progressively worsens, as you lose more and more cartilage in your knee. In the end, you typically end up with bone rubbing against bone. This can lead to painful bone spurs that form in the space where the two bones come into contact with each other. Who Is Most at Risk of Developing It? People who are 65 or older are the most likely to have osteoarthritis. But believe it or not, young adults and kids can get it too. 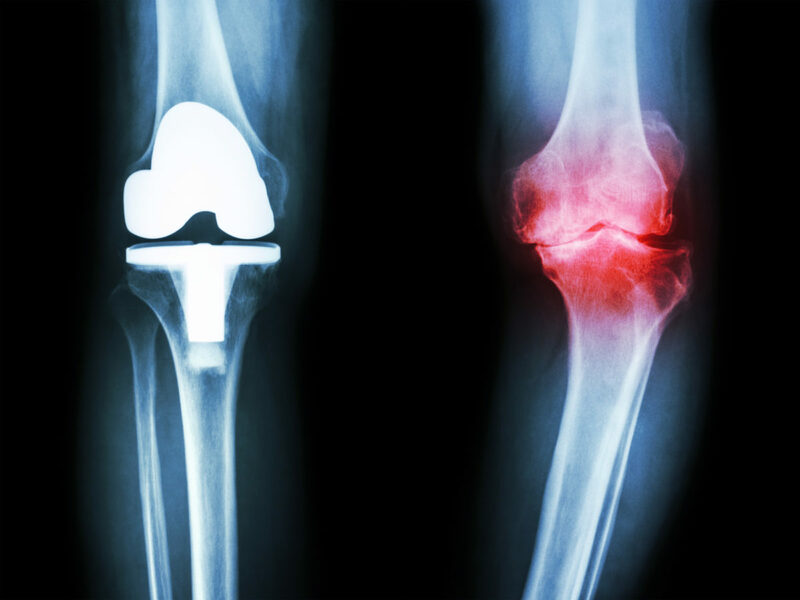 Trauma can play a significant role in the development of osteoarthritis in the knee. This is especially the case among young sufferers. It’s also important to note that women are more likely to suffer from this condition than men. Although estrogen is anti-inflammatory, women’s estrogen levels take a significant hit after menopause. Of course, you cannot control genetics or stop your body from aging. But the good news is that there few ways you can reduce your risk of developing knee osteoarthritis. For example, obesity is one of the major risk factors that you can control. Obese individuals are nearly 7 times more likely to get knee osteoarthritis. Exercising regularly can help you reach and maintain a healthy BMI. It also combats muscle weakness, which is another risk factor. Just make sure to stretch before your workout, and stick to low-impact movements. If you’re looking for other lifestyle changes you can make, try resting more. This allows your joints to heal and helps you avoid recurring injuries. When we think of arthritis, we immediately imagine severe joint pain. In total, there are five stages of knee osteoarthritis. Keep in mind that symptoms vary depending on how advanced the condition is. If you’re in stage 0 or stage 1, you probably won’t even feel any pain. In fact, you most likely won’t notice any symptoms whatsoever. An x-ray might not reveal anything troubling either. At stage 2, x-rays should show some bone spur development. There will still be plenty of healthy cartilage in your knee. But you’ll begin feeling occasional pain after engaging in strenuous physical activities. Stage 3 is when cartilage loss will be easy to spot on an x-ray. You’ll notice pain and discomfort throughout the day. Chances are, you’ll deal with some swelling as well. The symptoms of stage 4 osteoarthritis are severe. The cartilage in your knee is almost entirely depleted by this time. You’ll experience constant inflammation, stiffness, and pain. What Treatment Options Are out There? Currently, there’s no cure for osteoarthritis or most types of arthritis for that matter. But there are multiple routes you can take to minimize your knee pain. Let’s look at a some of the best treatment options that are available to you. Osteoarthritis sufferers often rely on over-the-counter meds such as acetaminophen, ibuprofen, and naproxen. These can be effective when dealing with mild-to-moderate pain. To combat intense pain, however, doctors might prescribe COX-2 inhibitors. When you have knee osteoarthritis, you end up using your knees less and less. As a result, the muscles around the knee get weaker, which stiffens your joints even more. Physical therapy combats this by helping you strengthen the surrounding muscle. It also works to increase the range of motion in your knee. Your therapy plan may consist of both active treatments, such as exercise, and passive treatments, like heat therapy. Knee braces may also come into play, as they provide additional support and enable you to engage in more physical activities. There are four injection procedures used to relieve knee osteoarthritis symptoms. Here’s a quick rundown on all of them. To treat knee osteoarthritis sufferers, doctors typically inject steroids directly into the knee. Corticosteroid injections reduce pain fast and have less side effects compared to oral steroids. This treatment is often used in conjunction with other treatments, including OTC meds, braces, and therapy. As a knee osteoarthritis sufferer, your joint contains less fluid than normal. As a result, your knees are more susceptible to wear-and-tear due to friction. This treatment involves the injection of fluid into your knee, which provides more cushion for your joints. It not only decreases pain and improves knee mobility but may also slow down the progression of your condition. Platelet-rich plasma therapy is one of the most promising non-surgical treatments for osteoarthritis. It involves taking blood from your body and carefully injecting it into the problem area. This procedure alleviates knee pain by accelerating the healing process. Stem cell therapy offers another alternative. When performing this procedure, doctors take stem cells from fat tissue and inject it right into the damaged joint. These injections promote healing and reduce inflammation. Genicular nerves are the nerves surrounding your knees. Radio-frequency ablation (RFA) involves applying heat to your genicular nerves with a needle. This creates a thermal lesion, which blocks the nerve’s ability to submit pain signals to your brain. When over-the-counter and prescription meds don’t provide relief, your doctor may recommend surgery. Arthroscopic knee surgery involves the use of a camera in order to get rid of loose cartilage and bone. Recovery time is brief, and pain relief is almost immediate. But the downside is that joint damage may continue to progress following surgery. Another surgical option is knee replacement surgery. A surgeon will replace any damaged parts of your knee with artificial components. While recovery will take several months, this type of surgery provides long-lasting pain relief. This type of therapy involves putting a spinal cord stimulator (SCS) in your body. The SCS device sends a current to your spine, which disguises the pain signal as it enters your brain. Unfortunately, many sufferers fail to see a doctor until their pain becomes unbearable. But it’s important to keep in mind that you have plenty of treatment options. Be sure to avoid self-diagnosis. A physician needs to look at your health history and conduct a physical exam to make a determination. If necessary, they may also order X-rays, MRI scans, and blood tests to confirm a diagnosis and eliminate other potential causes. If you want to take steps to relieve your knee osteoarthritis pain without undergoing surgery, set up a consultation at one of our locations. We offer several treatment options, including stem cell therapy and platelet-rich plasma therapy. previous10 Benefits of Yoga - It Doesn't Just Help the Lower Back!